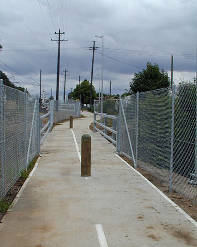 The Parramatta–Liverpool RailTrail (photos below) is opening on Saturday 2nd December. This is a great example of how the RTA and local councils can achieve things when they try. It was completed in a short time-frame with fairly good results. Well done to all involved, and let's have more of these projects! Particular congratulations go to Peter Morris, the RTA Project Manager. Its a great route for both novice cyclists and commuters. In one of our saddle surveys, we passed young kids on bikes with Mum. On the way back, going at a brisker pace, we went from Liverpool to Parramatta in 40 min which is almost the same as by car or train. As the route follows the train line, it has very easy gradients and it goes past shops, schools, and sporting grounds. CAMWEST got involved in the promotion of this new cycleway by including it in the route of its annual Bay to Mountains community bike ride. We heard very good comments from riders. We did a 'saddle survey' and produced a full cycleway audit report (download below). Our main gripe is a nasty habit of installing posts and signs where they are going to hurt people. It also seems that a number of councils made compromises to the recommended designs, which is disappointing. The exception to this is Holroyd Council, with its sections very well implemented. The RTA are launching the new Parramatta-Liverpool Rail Trail on Saturday 2nd December, 12 noon in Cabravale Park near Cabramatta, by the Transport Minister, Carl Scully. CAMWESTies will ride to the launch site and the most convenient starting point for most of us would be at Merrylands railway station (east side) at 10am. It's a mostly fabulous ride for the whole family. We urge you to come and show Mr Scully that there are lots of us westie cyclists around and that this cycleway will be well used. Repeat this success story along the western line and the upcoming Parramatta-Chatswood link. 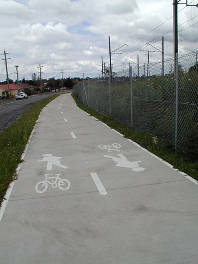 Implement the recommendations in our cycleway survey report. Remove dangerous posts which achieve nothing. Install bike lockers along the route. Get all councils to implement designs fully instead of cutting corners. Good news: many of the problems have been addressed after we (and other cyclists) raised them. 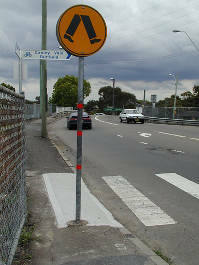 Some centre poles have been removed, as well as the crossing sign post (see photos below). It just goes to show that we (and you!) can make a difference. Why not join us in our advocacy work? Write to the Minister for Transport, The Hon. Carl Scully, as well as your local councillors. Congratulate them on the work well done, and ask them to keep it up. 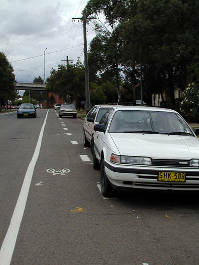 We need to accelerate the implementation of the BikePlan 2010 so as to finalise it by 2005. Good markings... They tell pedestrians to keep to the left. They're also warned of cyclists using the path. This 'legitimises' cyclists. Bad posts... And there's no cars around to stop! Not even reflectors to warn the poor rider at night. Nice ramp onto path, and good signage. 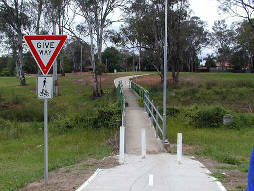 (The sign indicates this section of the path is for cyclists only). Nice location for the sign - not! Cyclists have no room to squeeze through. A curved post should be used instead. At least it has some reflective tape. 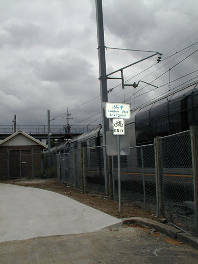 Note also how the cycleway sign may be obscured. More evil posts, and again with no reflectors and no cars to stop. What's the big idea? We suspect it may be to slow people down. There are other, less dangerous ways to do this. So what do you think? Have you tried the RailTrail? What other infrastructure projects should be completed in the West? Let us know, and we'll publish your thoughts. Join our mailing lists.